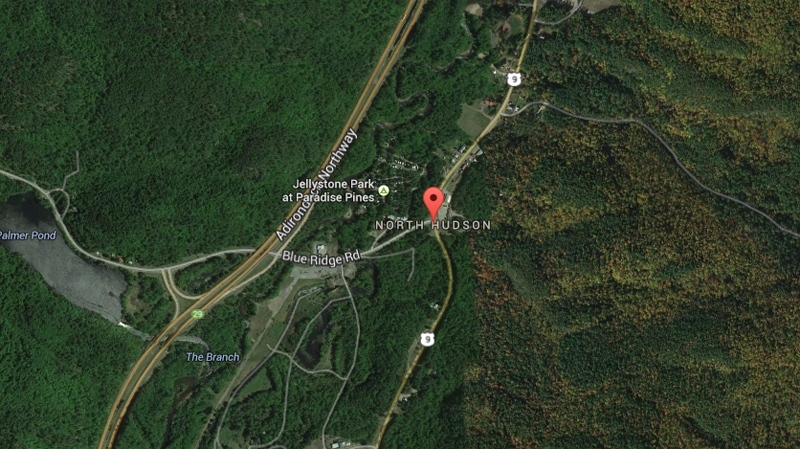 A teenage girl from Quebec has died after a southbound bus she was travelling on veered off the I-87 near North Hudson, New York Friday morning. 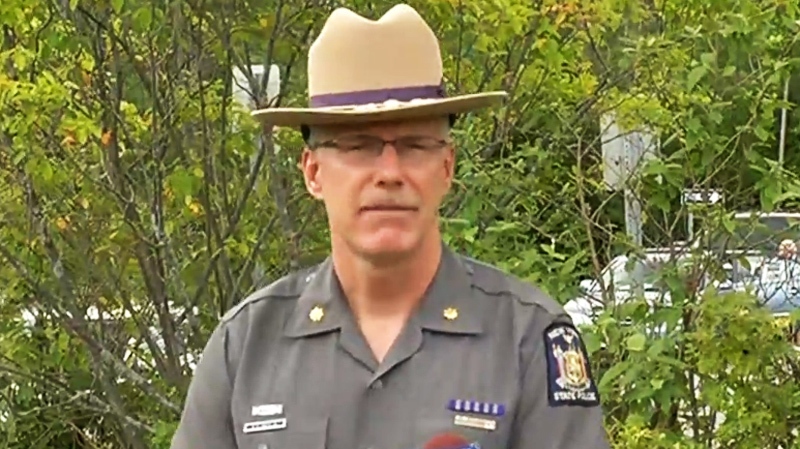 "The individual was ejected or partially ejected and the bus landed on top of that individual," said Major Richard Smith State Troop Commander of New York State Police at an afternoon press conference. An attempt was made to lift the 2008 Prevost bus sufficiently to help, but the young woman succumbed to her injuries. 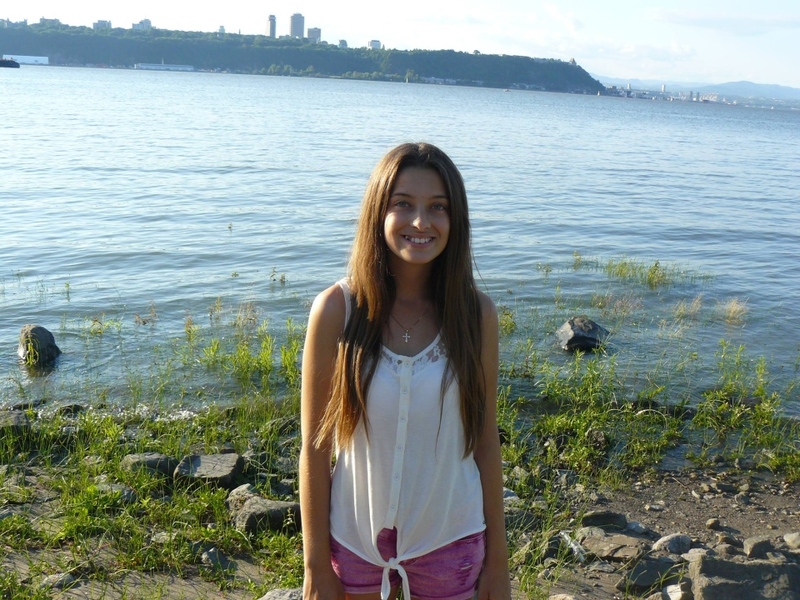 New York State Police have identified the girl as Chelssy Mercier, 14, from Quebec. The girl's mother was travelling on the bus with her, police say. Passengers escaped the bus through the front windshield and an escape hatch atop of the charter bus operated by JaimonVoyage.com, which went off the road sometime between 7:30 a.m. and 8:15 a.m. Friday. Three of the survivors were categorized as the worst injured and one of those was transported to hospital by Medivac. Ten others were injured but not in critical condition while 41 others were deemed to be less seriously injured, deemed to be "walking wounded," according to Patty Bashaw Emergency Medical Services Coordinator. None of their lives are considered to be in danger. Audrey Lessard, 20, was on the bus. She has two broken ribs from the crash but is otherwise unhurt. She was asleep when the crash happened. “The bus was on its side and I woke up to find myself sitting sideways,” she explained. She climbed out of an emergency exit in the roof. Her boyfriend, who she was travelling with, was more seriously injured and will have to stay in hospital for three days, she said. In addition to New York State Police and “multiple” fire and rescue agencies from Essex County, the Royal Canadian Mounted Police, Surete du Quebec and French interpreters were called in to assist. 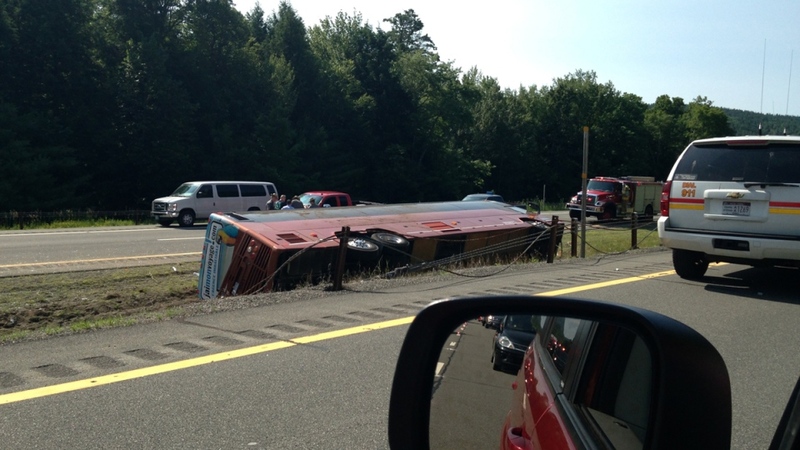 The bus went off the roadway and rolled onto its side in the grassy median near Exit 29 while travelling south on Interstate 87 - also known as the Adirondack Northway - between Plattsburgh and Albany. "The bus started down the embankment and rolled down its side and slid on its side down into the median," said Smith. "We are fortunate that only one of the individuals lost their lives." The charter bus was transporting one tour guide and 53 passengers, including many young adults. The passengers ranged in age between six and 54. They were all ferried to five local hospitals. Police say the 61-year-old driver, a Canadian citizen who is not being identified at this time, has been inspected as a driver three times in the past year and has passed all three inspections. He is being interviewed and tested for drugs, according to Smith. "He was not complaining of any injuries in the immediate aftermath. That's not unusual due to the shock and adrenaline. He had no physical injuries but certainly emotionally he's injured," said Smith. The bus had left the night before from Quebec City but also picked up others in Trois-Rivieres and Longueuil throughout the night for a three-day weekend trip to New York City. Josiane Grimard of JaimonVoyage.com had no word on the cause. She said the vehicle was owned by a subcontractor. The company's two-day, three-night trip is advertised as costing $189. The tour operator's marketing director Nancy Trudel said the company's owner, Andre Poulin, was en route to the accident site to help the passengers and provide any support he can on site. The company dispatched another bus to bring the passengers home Friday morning. "For us, our priority is the passengers," Trudel said. "But we don't know what happened or how the accident occurred." While the tour is operated by JaimonVoyage.com, Trudel said the charter bus is operated by Autobus Fleur de Lys, based near Quebec City. A number of local rescue squads were sent to the scene, where the bus laid on its side in the median. The accident occurred between exits 29 and 30 in North Hudson, which is about 150 kilometres north of Albany. Traffic continued but was reduced to one lane. Some other motorists reportedly pulled over to help following the crash. Smith saluted a pair of Canadian families who stopped their vehicle immediately after that crash and "risked their own lives" by helping try to lift the bus off the deceased. They also helped with CPR and stayed on the scene to help in other ways. "I just want to commend them for the human value of the effort that they put into helping at the scene of this accident," said Smith. "From a police officer's standpoint, knowing that citizens otherwise engaged in their own lives will stop and lend a hand, it was very heartwarming,"
Anybody who wants information from the bus company can call 1-877-849-0444.